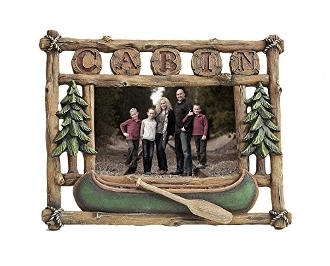 Gift Craft Cabin Picture Frame, 4" x 6"
Our Products >> Gift Craft Cabin Picture Frame, 4" x 6"
For over 70-years, Gift craft has earned the trust of retailers and consumers worldwide by offering a diverse array of on-trend decor, jewelry, apparel, accessories and giftware at competitive prices. Each quality Gift craft design defines personal style and individuality and is certain to create a Life Well Styled. Cut-Out Polyresin Photo Frame. Tree Branch, Canoe and Evergreen Tree detailing and CABIN sentiment. Holds 4x6 Photo.